Late lie, but still run. Helen and Tudor stayed up til one thirty am; missed your own party they said! Indulge in particularly luxurious breakfast of hot waffles, sitting at a window in the grand part of dining room, with views aft. Uli gives a lecture on Antarctic geology. Not sure I could repeat the substance, but truly enjoyed his impression of particle compression in the earth’s crust ­waving arms and bobbing up and down. Lie on cabin sofa and don’t move until lunchtime (well, only to breathe.) Down to the hold to pull out boxes of stock for the onboard shop, which we think will open for business on Monday night. Trolley twelve or so cartons up to a spare cabin for seeing what’s what. Christmas like discoveries. Try to memorize prices. Helen’s turn to feel queasy. Reward ourselves with tea + biscuits. We’re nearly at Elephant Island, ­ the computer screen maps show ship virtually upon it ­ but can see nothing through thick fog. 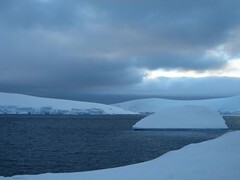 Suddenly we are at Cape Wild, where twenty-two members of Shackleton’s crew were infamously marooned for four and a half months. Out on the prow, we can just make out shapes of rock, swirling white and the bronze bust of Capt Pardo, who eventually rescued the men, standing incongruous. The places resonates with feeling, deadened by snowflakes. Briefed for landing on South Shetland Islands. Late sitting for dinner; all rather sober tonight. Stop and talk with Mairi (from the Western Isles) who is always affirming. She says how strange it will be without the Port Lockroy team aboard ­ only two more days, three more nights in a warm comfy bed. I’m getting scared.